One Fillmore County 4-H Club saw a need in the community and decided to do something about it. The Green Team 4-H Club, of Geneva, partnered with UNL Extension and Fillmore County Schools to complete a service project at the Downtown Gym. Club members participated in a 4-H Citizenship program called Focus on Citizenship, which seeks to engage youth in their communities through civic education and personal development. They attended a workshop taught by UNL Extension Assistants, Megan Burda and Shelly Stitt, in June. Youth participated in a variety of activities, which included defining citizenship, character building and community mapping. Club members filled in a map of Geneva and were asked to identify parts of the community that they liked, things that need improvement and what they would like to see changed. The group decided that they would like to focus their efforts on the Downtown Gym. Fillmore Central Schools Superintendent worked with the club to come with a list of possible project ideas. It was decided that they would like to focus their efforts on the outside of the building by landscaping and painting. Club members met and developed a landscaping plan for the south side of the gym. The plan included Nebraska native grasses, which were paid for by Fillmore Central Schools. The club also received a community grant in the amount of $250 from the Fillmore County Foundation to purchase additional landscaping materials. Rock was purchased and the ground was tilled. On September 4th, thirteen club members, 4-H parents and Megan Burda met at the Downtown Gym to complete their service project. They spent three hours on a hot day painting the outside rails, digging holes, planting grasses and covering the area with rock. On September 24th, the club celebrated their success. They watched a photo slideshow from the work day and reflected on their accomplishments. 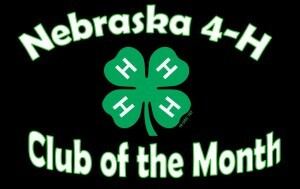 The Nebraska 4-H Foundation and Nebraska 4-H Ambassadors are proud to call the Green Team 4-H Club of the Month for November 2013. No Comments to "The Green Team – November 2013 Club of the Month"